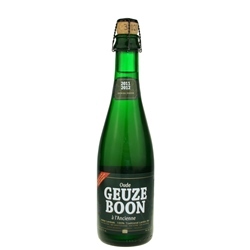 Top fermented with the wild airborne yeasts specific to Belgium's Senne region, Boon Oude Geuze is a bottle conditioned blend of mature and young lambics. The brew pours a hazy golden color with a moderate white head and a 7.0% ABV. Aromas of citrus, green apples, lemongrass, white wine and oak herald a flavor profile that charts a similar course and also includes grapefruit with notes of ginger and vanilla. The finish is clean and dry, the remaining subtle sweetness balanced by a slight hop bitterness. Pairs well with an array of strong cheeses. 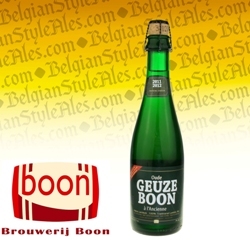 Boon Brewery was founded in 1975 when Frank Boon, seeking to revive interest in a flagging industry, purchased a lambic brewery in Lembeek, a village in the Senne region of Belgium from which, incidentally, the lambic brew style takes its name. 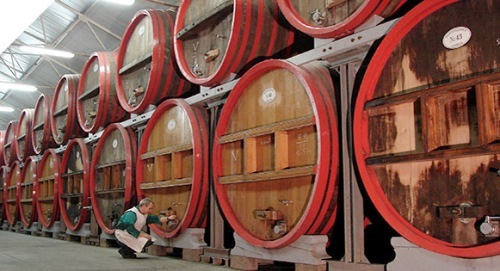 Lambics are a unique Belgian tradition: wheat beers wholly dependent on local, wild airborne yeasts for fermentation with an exceptionally long period of maturation (up to 3 years in oak barrels). The brewery had been making and blending lambics under various owners before Frank Boon acquired it; cognizant of the weight of the past, he set about making improvements to expand operations for the future, and over the next decades, against the odds he would grow the business into one of the most respected lambic breweries in the world.